Before I start, this article assumes that you already have a Samba share you want to access and that you are running Windows (XP, 7, 8 its all kind of similar). 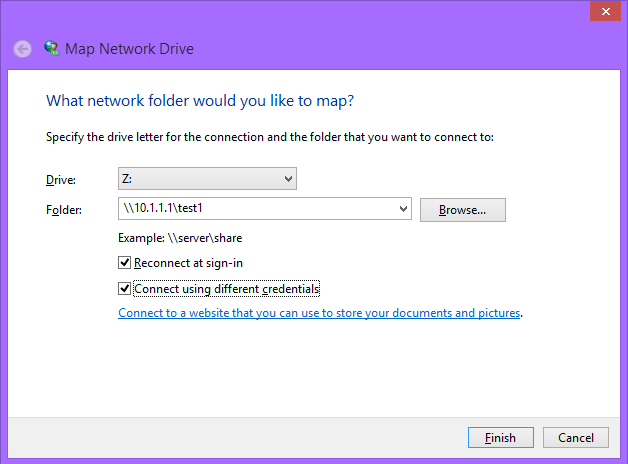 It’s quite a straightforward guide and I’ll go into how you can apply a Group Policy to map a drive automatically at login. First of all, you should be able to connect directly to the share by navigating to \\x.x.x.x\share-name\, although you might not be authenticated to view it if there are permissions applied to it. Next, give it a drive letter and put the share’s address in. Note that this is whatever you named the share heading in /etc/samba/smb.conf and not necessarily its absolute path on the server. If you want the drive to be persistent, IE appear when you next log in, keep “Reconnect at sign-in” checked. If the drive requires authentication from specific users, click “Connect using different credentials”. If this is on a different domain, make sure the username is in the format of domain\username and that you check the box to remember your details, otherwise you’ll have to keep typing in your password every time you want it to connect. Your drive should now be mounted and reconnect when you logon! 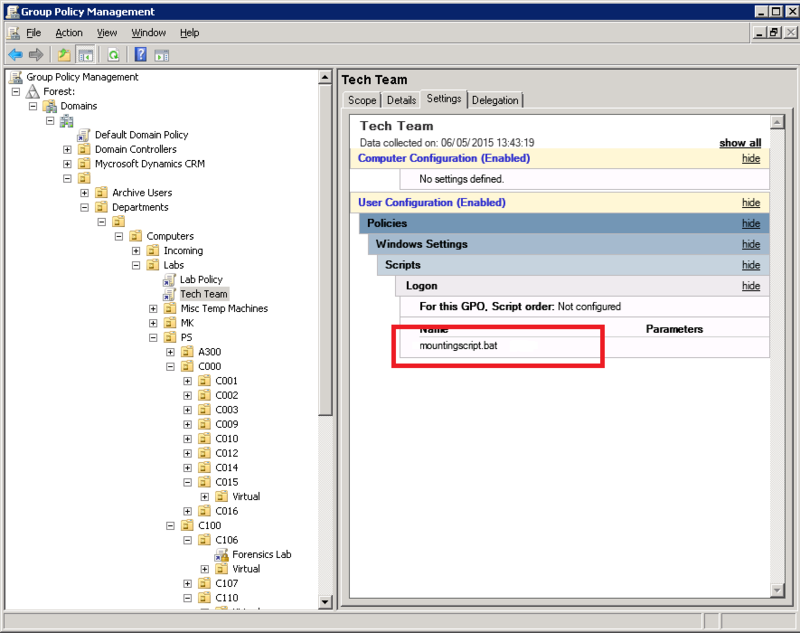 Going on from the command line mapping, you can also map drives this way through using Active Directory Group Policies. 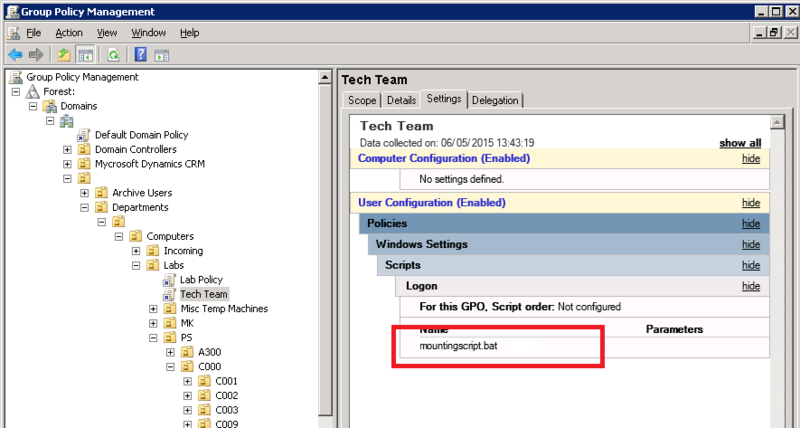 For this, you need to have permission to create Group Policies on your domain controller. Next, right click on the OU with the computers in that you want to apply to Group Policy to and select the option to make a new GP and to link it here. 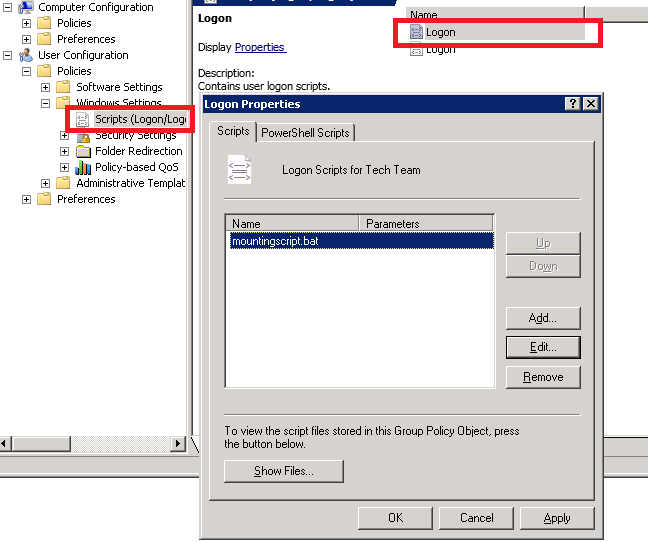 Edit the policy to the level of User Configuration > Policies > Windows Settings > Scripts (Logon/Logoff). We can add scripts here that we want to execute at user logon. Right click “Logon”, select properties, click “Add” and create a new file named mountingscript.bat file in the folder for your GP. This will map three shares to three different drive letters. persistent:no is also added so that the drive isn’t saved between logons. This is optional, but a good idea to include because the drives might end up being changed remotely, later. 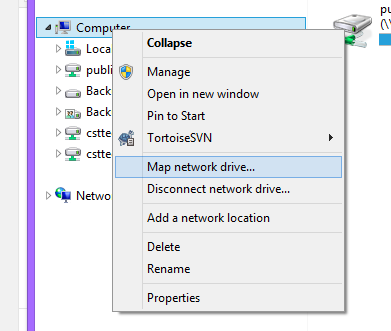 Additionally, you might want to delete the drives in case somebody else has mapped them already, with net use [drive] /d(elete) before each drive. The changes should be saved immediately when you click apply, although they make take some time to propagate through to the different domain controllers. You can verify the settings in the Settings tab. One final thing you can do is to restrict which groups this policy applies to. Up until now, there hasn’t really been a reason to use the default Lab Policy that already exists for the same OUs. But we can target specific users – such as a technical team – by making a new policy which has its Security Filtering only apply the GP to specific users and groups. For this, you will want to remove “Authenticated Users” and replace it with a group (or groups) of your choice. Its important to remove “Authenticated Users”, otherwise you’ll not have restricted it at all! If you’ve configured it correctly, you should now get a drive (or drives) show up at logon for any domain user who’s logged onto the OU that the Group Policy applies to. I hope this manages to help people to mount their Samba shares seamlessly with the rest of their Windows Network. There’s very little to really talk about with the Linux side as, once it is set up, it should appear to the user no different from a Windows Server share. If you have any questions or comments, please do get in touch or leave a comment below and I’ll try to help! Can a samba share be mounted in Windows to be available to SYSTEM user and be persistent trough reboots? Can’t really try this out right now but if this helps, can you let me know?